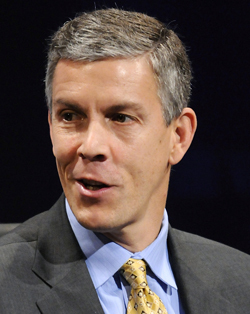 Education Secretary Arne Duncan doesn't obey the law... because he doesn't have to. The accountability I want to talk about isn’t student accountability - a phrase that is typically used as code for “more testing.” Instead, I’m interested in accountability to the people making education policy, a group that has emerged largely unscathed from their numerous collective blunders. In a recent report, the Pioneer Institute pointed out that the PARCC standardized tests - you know, the ones that states are abandoning like rats fleeing a ship - are funded by a conditional grant that requires fifteen states to participate. Currently, only seven states and the District of Columbia are using PARCC, and many of those are only barely using it. In a sane world, this would result in the loss of PARCC’s grant. However, as anyone who spends any time politics will no doubt have guessed by now, the funding continues unabated, to the tune of $186 million. The rules are there, but without consequences for breaking them, they might as well not be. This kind of thing is a systematic problem with the Department of Education. The laws meant to rein in the agency’s power are not enforced and even if someone wanted to enforce them, it’s unclear what kind of penalties these violations carry. Case in point, the provision in the U.S. code relating to federal education standards and curricula. That seems pretty clear, but we know that Education Secretary Arne Duncan has not allowed this to stop him from threatening to pull funding from states that ditch Common Core. Since the law doesn’t stipulate what happens to a Secretary who disobeys it, nothing happens at all, and the prohibition has no teeth. This is one of the main concerns about current efforts at federal education reform. The anti-Common Core language is being strengthened, but the continued absence of a clear enforcement mechanism calls into question whether these reforms will actually have any meaningful effect. Until the government is actually willing to hold itself accountable for the laws it passes, real progress on reform is going to be slow going. Sometimes the question comes to the mind that accountability is one of those words that look to crop up in educational plan. Everybody would probably approve that liability is a good thing, but as we all know that it’s easy for people with dissimilar understandings regarding the same concept. Here we are not talking about the accountability of pupils. It is a statement that is normally utilized as code for “more testing.” As an alternative, we are here talking about accountability to the people who are making education policy, a group that has developed largely intact from their countless collective mistakes According to a report the Pioneer Institute highlighted that the PARCC standardized tests are sponsored by a provisional grant that needs fifteen states to contribute like https://omnipapers.com/. There are only seven states and the District of Columbia that are utilizing PARCC, and many of those are hardly utilizing it. Duh! Dummy Duncan speaks mouthing words from Obama and Ayers like a compliant puppet and that is exactly what Arnie Duncan from Chicago failed schools is, dumber than dumb but politically compliant...Bring education back to the states and local governments...Never suppose to have feds control education or health care in America....Dangerous when all power ends up with idiots in Congress and a phony President!